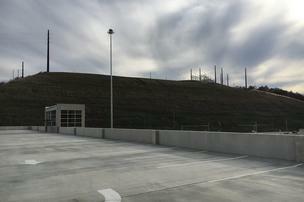 The hill behind the new parking garage once extended over the entirety of the site on which the garage was built. Overall, Shell moved 7 million cubic yards of dirt as part of the cracker site preparation. Shell Chemical Appalachia and two environmental groups have reached an agreement on air quality monitoring in and around the Beaver County location that will house the ethane cracker. A news release Monday afternoon from the Clean Air Council and Environmental Integrity Project said Shell has agreed to build a fenceline air monitoring program that will complement another monitoring system at the plant site in Potter Township, as well as more tests for flares from the plastics manufacturing facility. The fenceline monitors will measure for emissions and will be investigated by Shell if it registers at a specified level. The measurements will be available to everyone on a website. A spokesman for Shell wasn’t immediately available for comment, although a comment fromÂ Ate Visser, vice president of the Shell ethane cracker plant, was included in the news release. “We are pleased to have reached this settlement, and now our full focus will be on delivering the facility, with its state-of-the-art operations and environmental controls, which will bring jobs and economic benefits to many western Pennsylvania families for decades to come,” Visser said in the statement. The environmental groups had filed an appeal in 2015 of the permit from the Pennsylvania Department of Environmental Protection, wanting more from Shell in terms of compliance with the environmental regulations governing the plant that will be built and operating next decade. Needless to say, this is a very large economic development project for Southwestern Pennsylvania and the Tri-State region. It deserves our support! This continues to be one of the most important economic development projects in Pennsylvania. Let’s continue to promote it.